Once again, the entire world celebrates the birth of Jesus, the Christ. The fact that Christ was not actually born on December 25, as the date merely serves as a commemoration of his birth, has become common knowledge for many Christians. What is important is not the exact date of Christ’s birth, but that he was born into the world—a prophet, a guru, a revolutionary, a visionary, perhaps even a life coach; but undoubtedly the face of God to those who hear and respond to his message. Christmas often brings out the best in people. For some, it may be a time to engage in public worship, or to visit the homes of loved ones in order to share food, company and good cheer. For others, it may be a time to embark on bargain shopping, enjoy Christmas decorations in malls, and to have a brief respite from work. 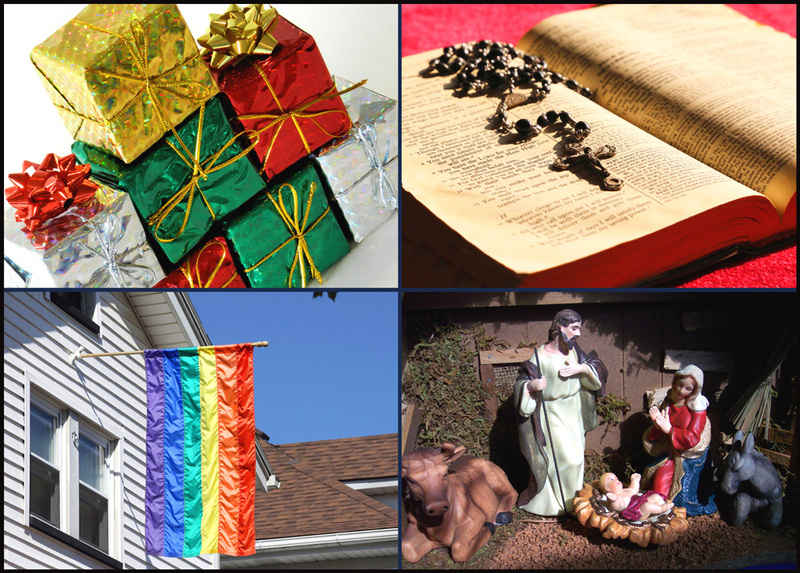 We often avail ourselves of some, if not all of these usual offerings of festivity; but I believe that there is a deeper meaning of Christmas that may resonate more intimately with our lives and experiences as LGBTIQ Christians. I suggest that if we focus on the events surrounding the birth of Christ, we will find something there that can offer us spiritual nourishment as we celebrate Christmas 2014. While I concentrate on a Christmas reflection that is meaningful for LGBTIQ Christians, I offer the same reflection to allies and all non-LGBTIQ Christians, and invite them to see how this reflection can resonate with the particularities of their own lives. Scriptural passages speak of angels announcing the birth of Christ to shepherds. Piqued by this sudden intrusion into their tranquil sheep-watching in the dead of night, the shepherds decided to engage in some reconnaissance of their own. We are told that they wasted no time in verifying the angels’ public decree. They discovered for themselves that the pledge of a Promised One had indeed been fulfilled, evident through sight, smell, sense and sound. Nonetheless, the shepherds did not savour the wondrous discovery exclusively for themselves—they found it crucial to share the discovery with everyone. I see the shepherds’ encounter with the Newborn as a threefold dynamic of questioning, discovering and witnessing that can enrich this reflection. The shepherds were informed of the birth of Christ by angels, the indisputable mediators of God’s message. Yet, the message of the angels was not merely a “do-as-you’re-told” directive. It was accompanied by an imperative for the shepherds to discover the reality of the message for themselves. I propose that this account can provide a valuable perspective for many LGBTIQ Christians. Those of us who are accused of being abnormal and “living in sin” might want to treat such accusations as divine invitations to learn parts of ourselves more deeply as LGBTIQ Christians. Any allegation that we are only accepted in the eyes of God and society if we “change” must be met with the courage to challenge such voices, because it is our right to interrogate those who judge us for who we are and how we live, and who find us defective and sinful. We have a sacred mandate to question and interrogate such judgements on our own terms in order to better understand who we are as LGBTIQ followers of Christ, even if it means interrupting the destructive homophobic and transphobic discourses of religious authorities. The shepherds made haste to experience and discover the content of the angelic message for themselves. They knew that what they saw and heard was real, but they needed to experience that reality in their own particular ways—to see, smell, touch and hear the Babe of Bethlehem. As LGBTIQ Christians, we must cultivate a sensitive wisdom that pays attention to the operations of our minds, our bodies and our senses, and to allow that sensitive wisdom to inform our relationship with God. Likewise, we must allow the insights and values of our relationship with God to inspire and guide the way we live as LGBTIQ Christians. We must also share our stories with, and listen to the stories of other LGBTIQ Christians as we continue to discern. This is a lifelong process of discovery, in which we gradually learn what it means to live as LGBTIQ persons and followers of Christ in our own specific circumstances. We must strive to become LGBTIQ persons of faith whose lives are guided by Christ’s values of love, justice, egalitarianism, dignity and respect, both for ourselves and for others. I believe that when we embody these values in concrete ways, we imitate Christ by revealing the face of God as he did. Pursuing this thought further, I believe that when we reveal the face of God, we are witness to God’s continuing presence among us. We become “full of grace and truth” (John 1: 14), the avenues through which God once again becomes flesh and lives among us. Perhaps more than anything else, it is this potential to act in persona Christi by revealing God to others, precisely as we are—as LGBTIQ Christians—and not as who we are not, that can form the deepest meaning of Christmas for us. Selamat Hari Natal. Joseph N. Goh is currently pursuing a Ph.D. in Gender, Sexuality and Theology with the School of Arts and Social Sciences at Monash University, Malaysia. He holds a Licentiate in Sacred Theology (S.T.L.) from the Jesuit School of Theology of Santa Clara University in Berkeley, CA. An ordained minister with the North American Catholic Ecumenical Church (NACEC), Goh is also a member of the Emerging Queer Asian Pacific Islander Religion Scholars (EQARS) and the editor of the Queer Asian Spirit E-Magazine (QAS E-Zine). Copyright © 2014 Joseph N. Goh. All Rights Reserved.